Grief is the normal response to any important loss in life. It occurs regardless of whether death followed a prolonged illness, or a sudden accident. Grieving people experience both physical and emotional traumas as they try to adapt to the upheaval in their lives brought about by the loss. Psychologists have long recognized that the grief suffered by pet owners after their pet dies is the same as that experienced after the death of a person. The death of a pet means the loss of a non- judgmental love source. There is no longer anything for the pet owner to nurture and care for. Furthermore, the owner looses his or her contact with "the natural world." These feelings can be particularly intense for the elderly, single people and childless couples,( for whom the pet also is a child substitute). SHOCK AND DENIAL- The reality of death has not yet been accepted by the bereaved. He or she feels stunned and bewildered-as if everything is "unreal." ANGER- The grief stricken person often lashes out at family, friends, themselves, God, the Veterinarian or the world in general. Bereaved people will also experience feelings of guilt or fear during this stage. BARGAINING- In this stage, the bereaved asks for a deal or reward from either God, the Veterinarian or the Clergy. Comments like "I'll go to Church every day, if only my pet will come back to me" are common. DEPRESSION- Depression occurs as a reaction to the changed way of life created by the loss. The bereaved person feels intensely sad, hopeless, drained and helpless. The pet is missed and thought about constantly. ACCEPTANCE- Acceptance comes when the changes brought upon the person by the loss are stabilized into a new lifestyle. The depth and intensity of the mourning process depends on many factors. The age of the owner, circumstances surrounding the death, relationship of the animal to the owner and to other family members, are all significant. Recently experiencing the death of a significant person in the owner's life can also affect how the pet's death is handled. Usually, children recover more quickly, while the elderly take the longest. Sometimes, the death of a pet will finally enable the bereaved to mourn the loss of a person, whose death had not yet been accepted. Giving the child permission to work through their grief. - tell their teacher about the pet's death. 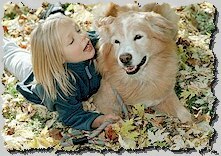 - encourage the child to talk freely about the pet. - give the child plenty of hugs and reassurance. - discuss death, dying and grief honestly. NEVER say things like "God took your pet," or the pet was "put to sleep." - The child will learn to fear that God will take them, their parents or their siblings. - The child will become afraid of going to sleep. Include the child in everything that is going on. Explain the permanency of death. What many people find hard to believe is that animals can form very firm attachments with each other. Even pets that outwardly seem to barely get along will exhibit intense stress reactions when separated. In fact, grieving pets can show many symptoms identical to those experienced by the bereaved pet owner. The surviving pet(s) may become restless, anxious and depressed. There may also be much sighing, along with sleep and eating disturbances. Often, grieving pets will search for their dead companions and crave more attention from their owners. Keep the surviving pet(s) routines as normal as possible. Try not to unintentionally reinforce the behavior changes. If the pet's appetite is picky, don't keep changing the food. All that does is create a more finicky pet. Don't over do the attention given to the pet(s) as it can lead to separation anxiety. Allow the surviving animals to work out the new dominance hierarchy themselves. There may be scuffles and fights as the animals work out the new pecking order (dogs mostly). Don't get a new pet to help the grieving pet(s) unless the owner is ready. It will backfire unless the owner is emotionally ready for a new pet. People still grieving won't have the energy for it. Should the owner let the surviving animals see and smell their dead companion? There is no evidence that doing so will help the surviving pet(s), but some people claim that it does. Usually, all it accomplishes is to make the owner feel better. Therefore, if the owner wants to have the surviving pets "say good-bye," then it should be allowed. Give yourself permission to grieve. Only YOU know what your pet meant to you. Memorialize your pet. Makes the loss real and helps with closure. Allows the bereaved to express their feelings, pay tribute and reflect. Draws in social support. Get lots of rest, good nutrition and exercise. Surround yourself with people who understand your loss. Let others care for you. Take advantage of support groups for bereaved pet owners. Learn all you can about the grief process. Helps owners realize that what they are experiencing is normal. Accept the feelings that come with grief. Talk, write, sing, or draw. Indulge yourself in small pleasures. Be patient with yourself. DON'T let society dictate how long mourning should last. Give yourself permission to backslide. It WILL end and your life WILL be normal again. Grief is like waves in the ocean: at first the waves come in fast and hard, but as time goes on, the waves become less intense and further apart. Don't be surprised if holidays, smells, sounds, or words trigger a relapse. Be sure to consult your own "Higher Power." Either religious or spiritual. Grief is probably the most confusing, frustrating and emotional thing that a person can ex- perience. It is even more so for pet owners. Society in general does not give bereaved pet owners"permission" to grieve openly. Consequently, pet owners often feel isolated and alone. Luckily, more and more resources are becoming available to help the bereaved pet owner realize that they are NOT alone and that what they are feeling is entirely normal. Margaret Muns DVM is the staff veterinarian on the Best Friends Animal Sanctuary forum. (http://www.bestfriends.org). Lagoni, L., Butler, C. and Hetts, S: The Human-Animal Bond and Grief WB Saunders, Philadelphia 1994. Chapters 2 and 10. Web site design by Web Tek Computer Company, Ephrata PA.